Clouds travelling the jet stream. Credit: NASA via Wikimedia Commons. Wondering where that radiation’s heading? 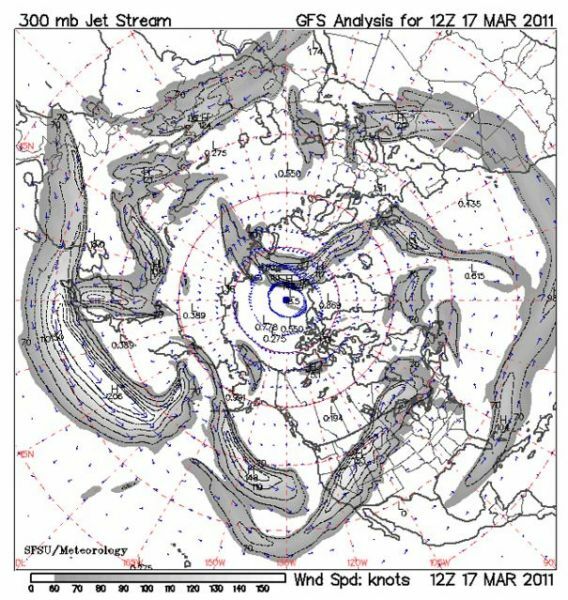 Jeff Masters at WunderBlog has used NOAA’s HYSPLIT model to forecast possible travel routes for Japan’s radioactive particles based on weather systems and the jet stream. You can see his forecast tracks here. Since there is less friction aloft, and the high speed winds of jet stream increase as the air moves higher in the atmosphere, this radiation will undergo long-range transport. Latest trajectory runs… show that radioactivity emitted today [Thursday] and Friday could wind up over Alaska and eastern Siberia after five days, and radioactive particles emitted on Saturday could make it to Hawaii and California by late next week. As to how much radioactivity will be travelling across the Pacific, that’s a lot more difficult to ascertain, since Japan hasn’t released either measurements or estimates of the totals—numbers crucial to forecasting any potential health effects. A leading radiological health expert at the Centers for Disease Control and Prevention, speaking on condition of anonymity, said Wednesday that the CDC was still confident that there would be no serious health consequences here. But CDC officials are watching the situation carefully. “We have a saying: ‘Modeling is OK, but measurement is everything,'” he said. Of most concern long distance is fallout from the Fukushima reactor number 3 and its spent storage pool, because both house fuel rods containing plutonium fuel—a risk to human health even in very small quantities. Japan’s helicopter efforts yesterday were focussed on reactor number 3. To get a sense of how weather is driving across the Pacific, you can see a near-realtime Northern Hemisphere jet stream model (above) here. FYI, this provides a view from over the North Pole, which might seem disorienting, at first. The entire North Pacific is in the lower left quadrant. The New York Times has an interactive radiation forecast tool here. The Canadian Weather Office has a beautiful big blue Pacific Ocean stitched satellite viewer here, from which you can infer a lot about what’s coming across the water and the meanderings of the jet stream. The Austrian Weather Service, ZAMG, is running shorter-duration radiation forecast models here.